Dorianne Laux's poetry is a poetry of risk; it goes to the very edge of extinction to find the hard facts that need to be sung. What We Carry includes poems of survival, poems of healing, poems of affirmation and poems of celebration. Sculptured, fluid and generous, they reveal a poet whose vision is informed by experience and caring. Of her poetry and poetic odyssey, critic William O'Daly writes: "It seems that Ms. Laux has chosen to witness what she must on her journey, in some way reliving and weaving together who she was and who she is to fully reclaim her body and soul ... The poems seem to have been well prepared for, born of years of hard work, careful listening, patience, until all the notes rang true." That attention to precision of image, language and sound, that pursuit of honesty and love is What We Carry - our lives, worth having, and worth transforming. Dorianne Laux's poetry is a poetry of risk; it goes to the very edge of extinction to find the hard facts that need to be sung. 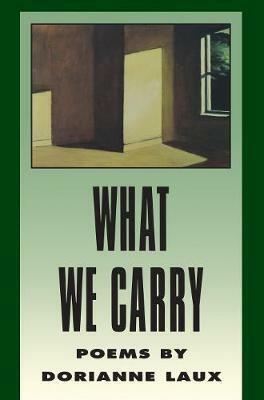 What We Carry includes poems of survival, poems of healing, poems of affirmation and poems of celebration. Sculptured, fluid and generous, they reveal a poet whose vision is informed by experience and caring. Of her poetry and poetic odyssey, critic William O'Daly writes: "It seems that Ms. Laux has chosen to witness what she must on her journey, in some way reliving and weaving together who she was and who she is to fully reclaim her body and soul ... The poems seem to have been well prepared for, born of years of hard work, careful listening, patience, until all the notes rang true". That attention to precision of image, language and sound, that pursuit of honesty and love is What We Carry - our lives, worth having, and worth transforming. Dorianne Laux was born in 1952 in Augusta, Maine and is of Irish, French and Algonquin Indian heritage. In 1983 she moved to Berkeley, California where she began writing in earnest. Five years later she earned her B.A. degree in English from Mills College. Laux's first book of poems, Awake, published by BOA Editions in 1990, was nominated for the San Francisco Bay Area Book Critics Award for Poetry. Her poetry has appeared in numerous American journals and anthologies. She has received poetry fellowships from the MacDowell Colony and the National Endowment for the Arts. Currently, she teaches creative writing at the University of Oregon in Eugene, Oregon.